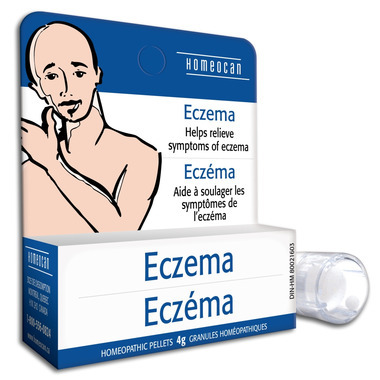 Homeocan Eczema Pellets are homeopathic medicine for dry or weeping eczema. Dosage: Children (2 to 12 yrs. ): 2 pellets. Adults and children (12 yrs. and over): 3 pellets. Let dissolve under the tongue 3 times daily and reduce intake with improvement or as directed by a healthcare practitioner. To be taken away from meals. Medicinal Ingredients: Fumaria officinalis 3K, Natrum muriaticum 6K, Agaricus muscarius 6K, Petroleum 6K, Sepia 6K, Kali arsenicosum 6K, Alumina 6K. Non Medicinal Ingredients: Lactose, saccharose. Caution: Do not use if seal is broken. Keep out of reach of children. Consult a healthcare practitioner before use if you are pregnant or nursing. Consult a healthcare practitioner if symptoms persist or worsen. Do not exceed recommended dosage. Keep at room temperature. They work well but for the amount needed you run out quickly. They should come in a larger size. I have really severe eczema on my hands and this for sure helps clear it up quicker and prevent it. I would recommend it. The downside is it is a little bottle and you have to take a lot daily so you go through one bottle in about a week. help for itchy skin ! Effective when used with eczema cream like Aveeno or Cerave (no Hydrocortisone). Definitely seen an improvement in my eczema since taking this product. This remedy really diminshed my eczema, more than any hydrocortisone cream I've tried in the past - I will need to get more of it in the near future. Found this remedy very helpful.